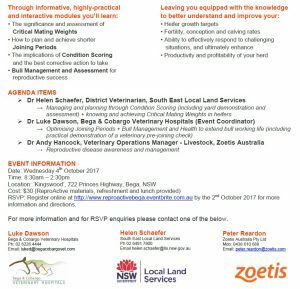 Developed by Australia’s leading vets, cattle specialists and rural business experts, ReproActive is an outstanding specialised training workshop series designed to help maximise the reproductive potential of herds. Each module will provide a wealth of knowledge to producers, resellers and veterinarians. ← Weeds…..stop feeling overwhelmed and help your community develop a plan!